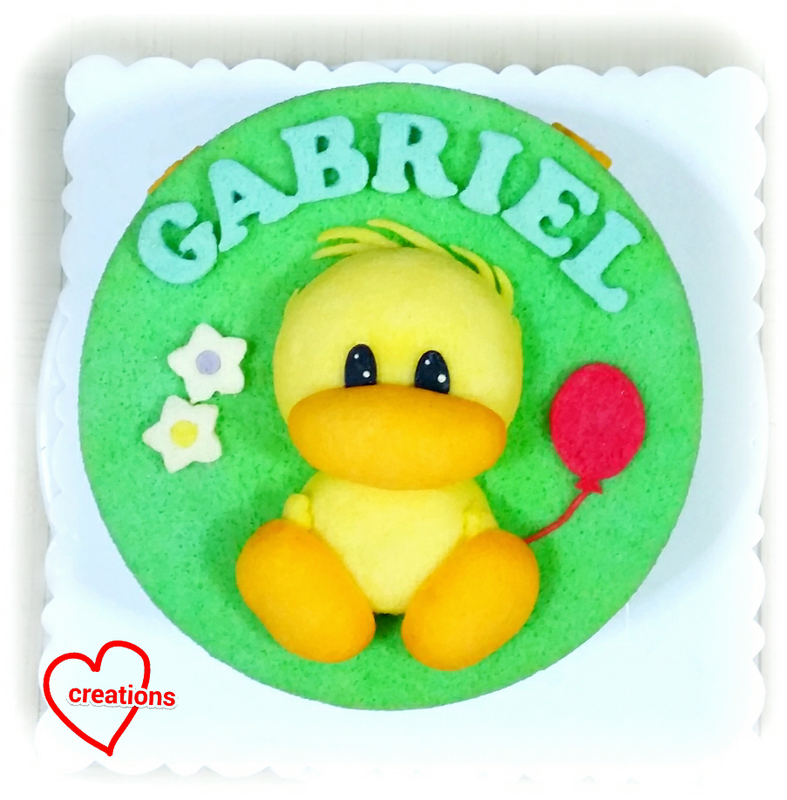 This is a Suzy’s Baby Witzy Duck made from Orange chiffon cake. The duck is happily lying on a green Pandan chiffon cake base. 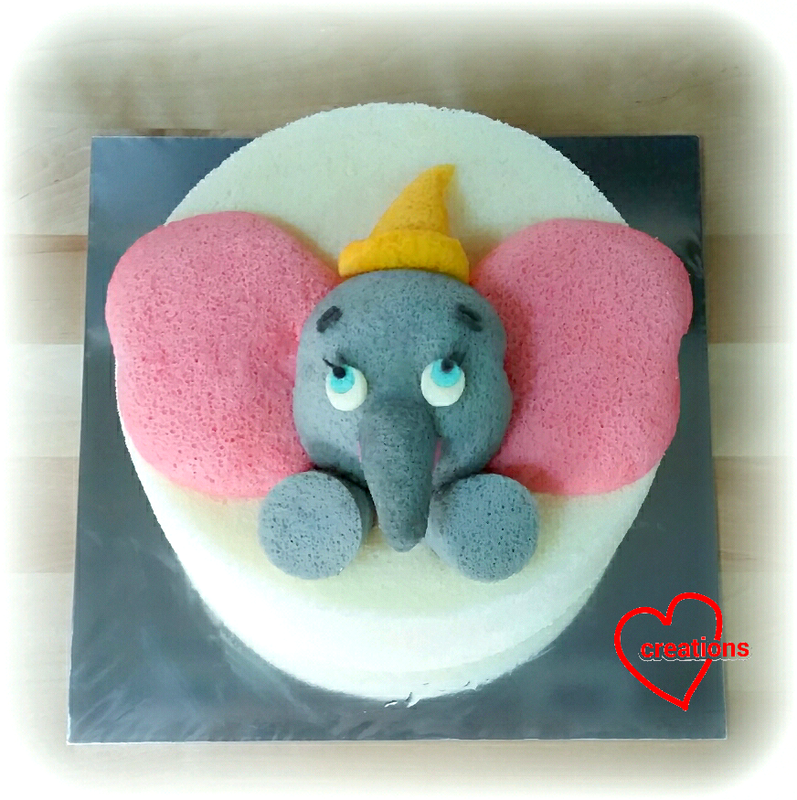 I really loved making this cake myself as I loved Suzy's Zoo when I was in school! It was based on the picture she sent me that I couldn't seem to find anywhere else. The baby duck face and small body were made from baking Orange chiffon cake in round glass bowls similar to Hatching Chicks with added natural tumeric-based yellow coloring (Iwaki, 11 mm OD). For the hair, I cut frays from an extra bowl chiffon cake using circular cutter and knife. The beak and shoes were also from Orange chiffon cake baked in oval glass bowls (inherited from parents) and cut into the size/shape. 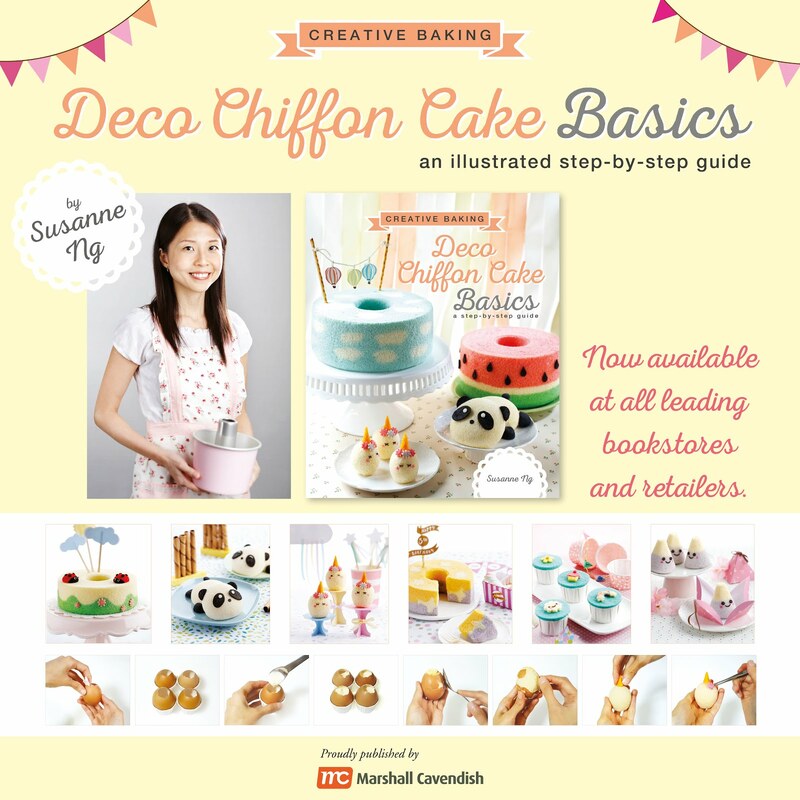 The red balloons and other features were from chiffon cake baked in layer trays and glued on with melted marshmallows. 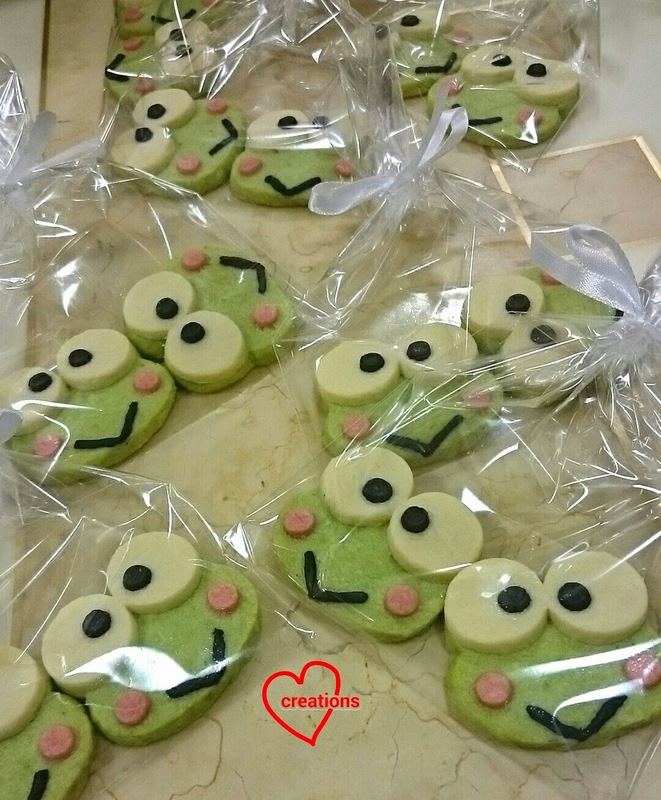 Thankful the cake was very well-received together with Phay Shing’s adorable Keroppi cookies! 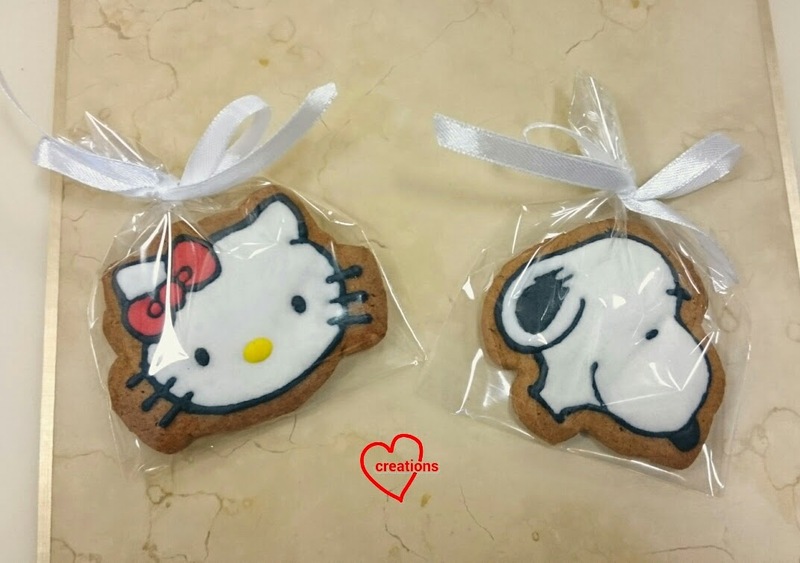 I have a request for dairy-free Hello Kitty and Snoopy cookies for a party so here they are! 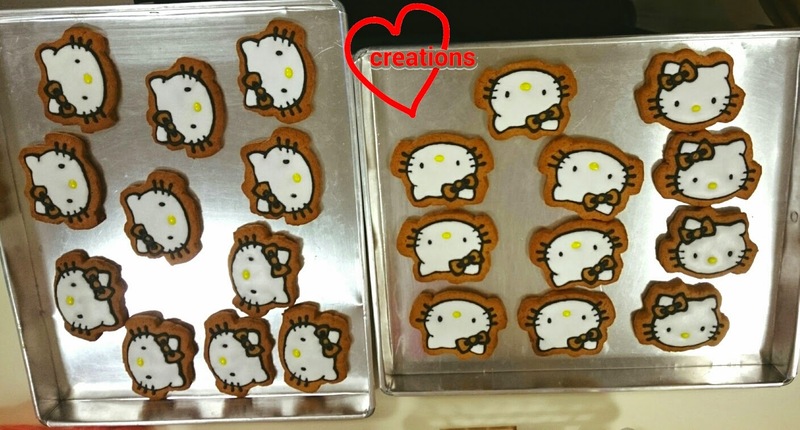 Only 4 here but I made 22 Kitties and 13 Snoopies! 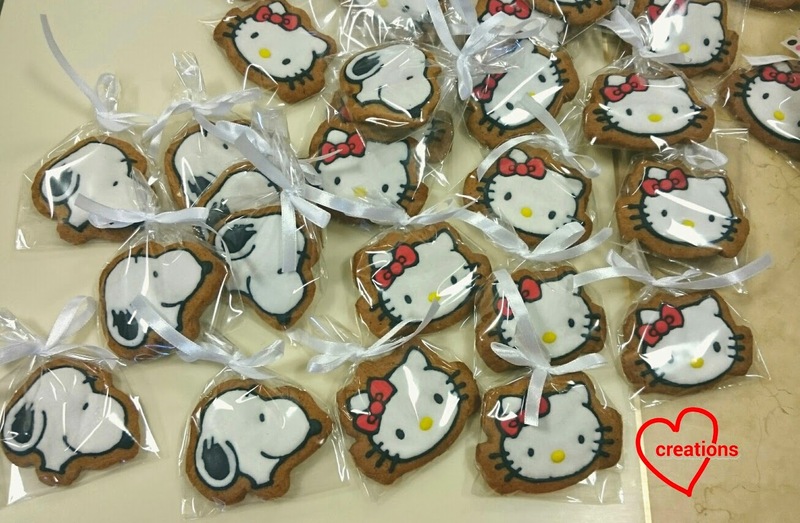 As the number of cookies is quite a lot, I chose to make just the head of the characters. 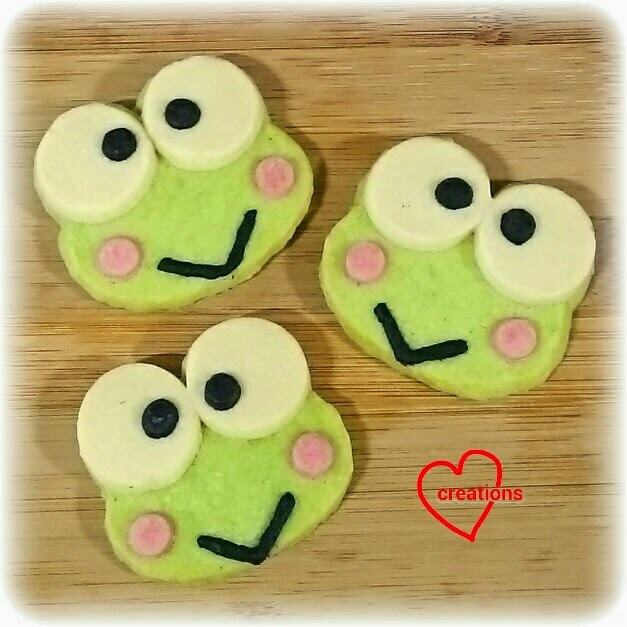 The recipe is adapted from my all time favorite brown sugar cookies with royal icing. Simply substitute the unsalted butter with vegetable shortening. You will find that the dough is easier to work with too. Less sticky but still remains soft and pliable after refrigeration. You need to freeze the whole tray of cookie dough cutouts before baking instead of putting the tray in the fridge for the cookie cutouts to be rigid when they go into the oven. 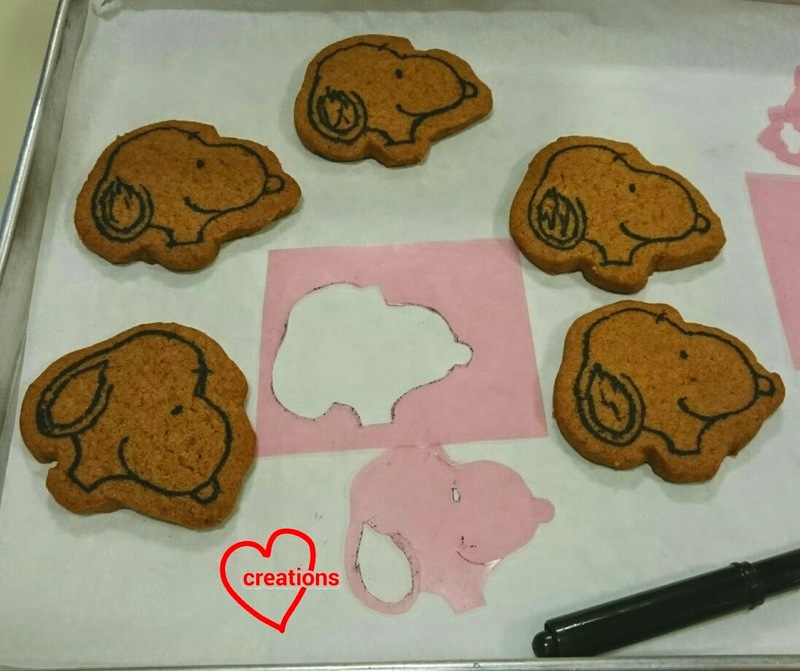 Freshly baked cookies with homemade templates! I rolled the dough to 5-6mm thick before cutting out the shapes. Bake at 160-170°C for 13-16 minutes or until browned. Leave on tray for 5 minutes before transferring to cooling rack to cool completely. Let the cookies rest in airtight container for a day before icing. 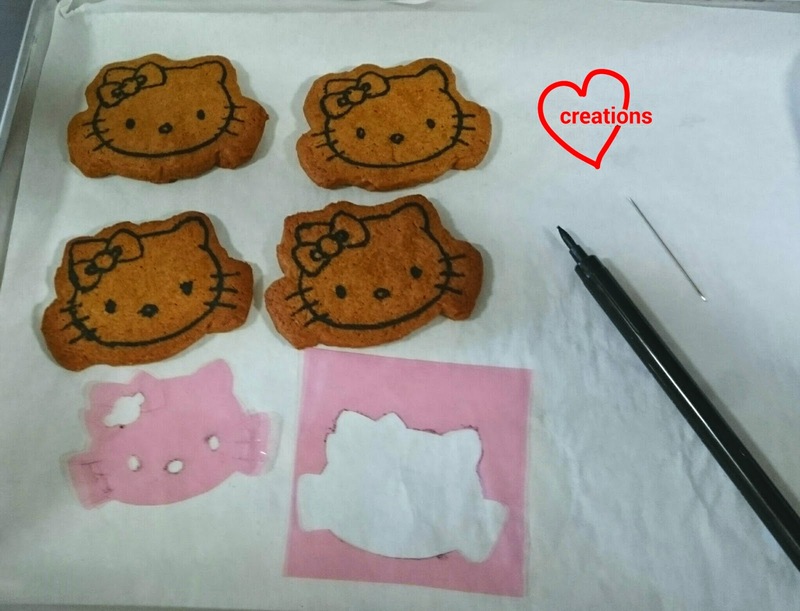 I am beginning to love using homemade templates for my customized cookies because it's so versatile! Any size and pattern of a particular character or object can be accommodated! Still tedious but that can't be avoided. 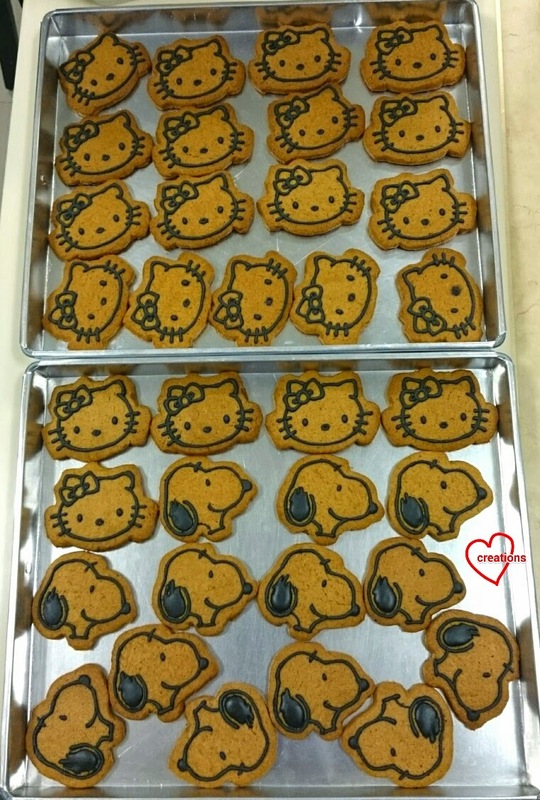 I borrowed the HK cookie cutter from Susanne but ended up not using it as I had to make a template for icing anyway. 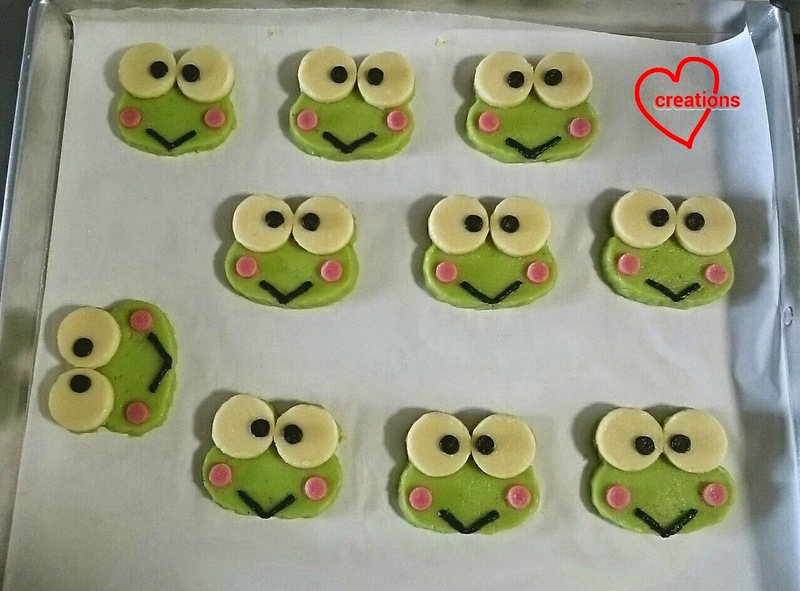 Wait for the icing to dry completely before flooding. 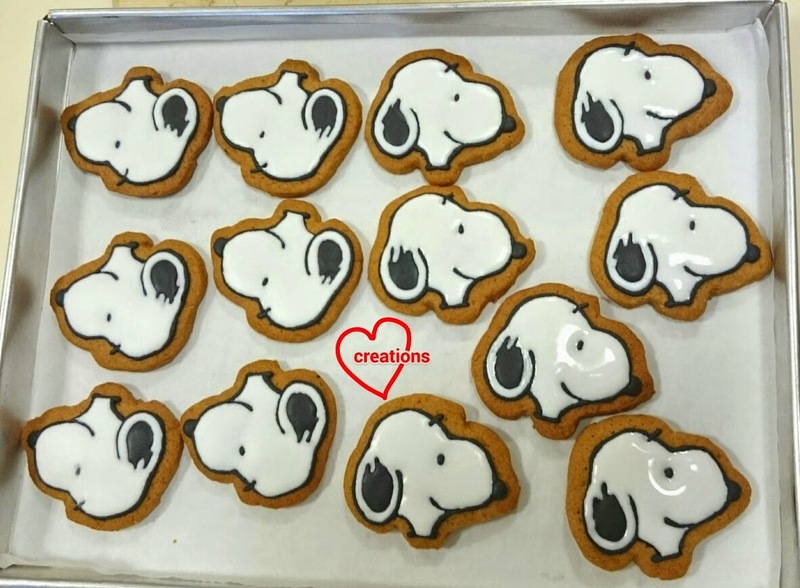 Filling in white for Snoopy! Adding in the nose and bow. I decided to leave out the outline for the nose in the end. Dried in the oven at 60°C fan mode for 8 minutes followed by overnight drying in aircon room. Ready for packing! These dairy-free cookies are just as aromatic as the ones with butter used. My kids and mum tasted some extras and said they were yummy! 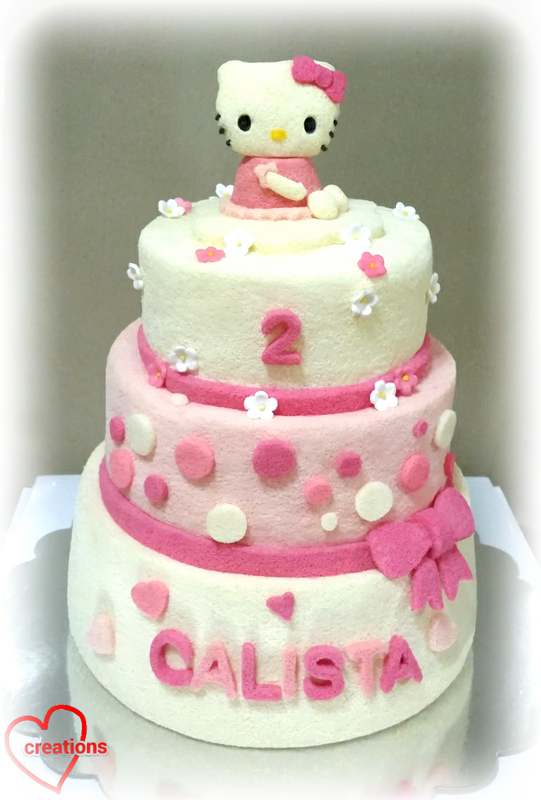 This is a loving Hello Kitty creation following my Hello Kitty Doll Chiffon Cake. 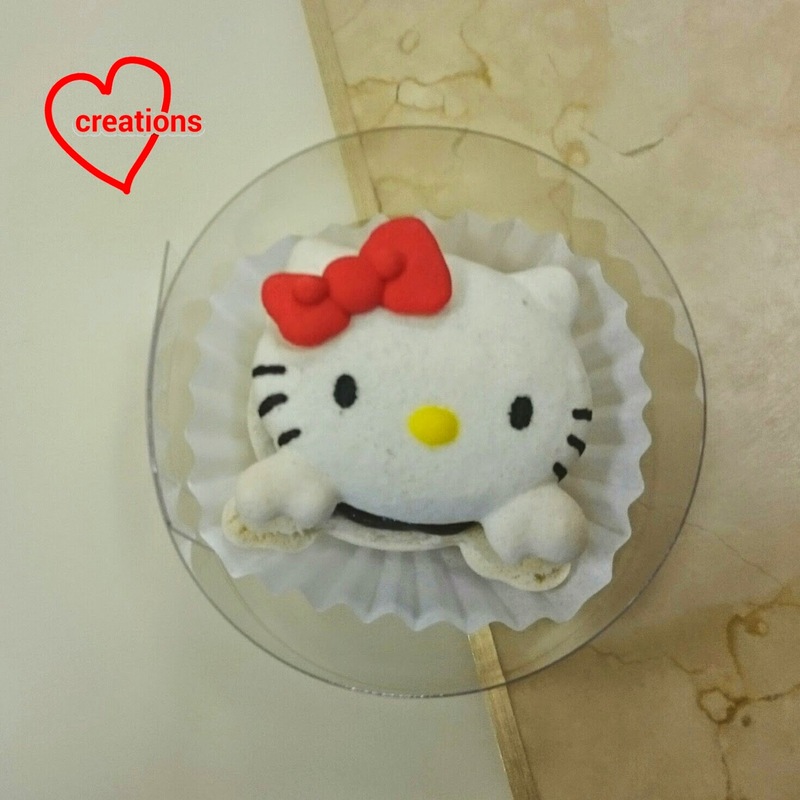 Instead of a big Hello Kitty doll, here I made a cute little Hello Kitty figurine from chiffon cake. 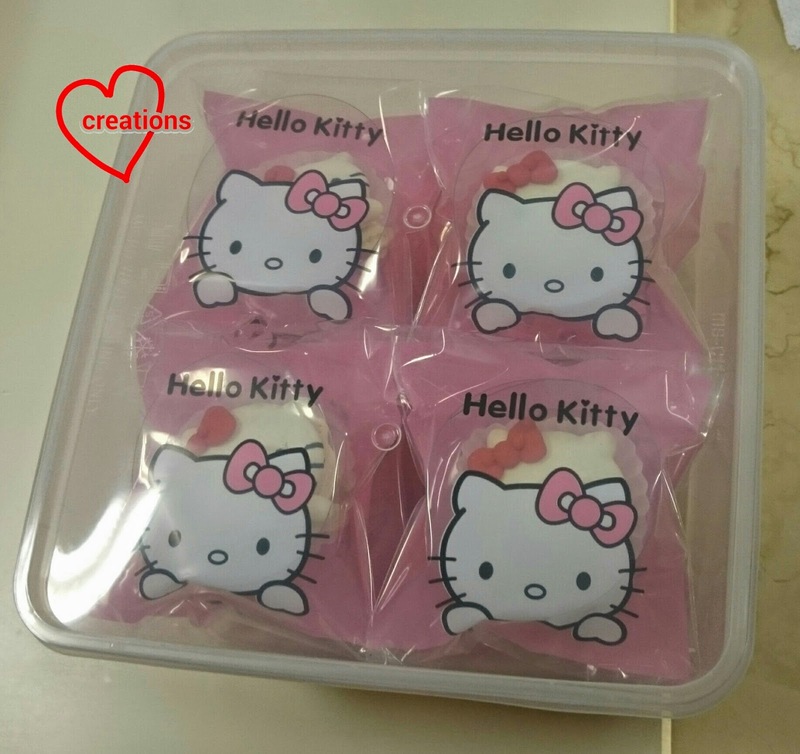 Some of you may remember the Hello Kitty chiffon pops I made for my daughter’s birthday last year? I made the figurine by placing the small Hello Kitty face pops on a chiffon cake cut out from a cone to make the dress. The top tier is flowers-themed and a cream vanilla chiffon. 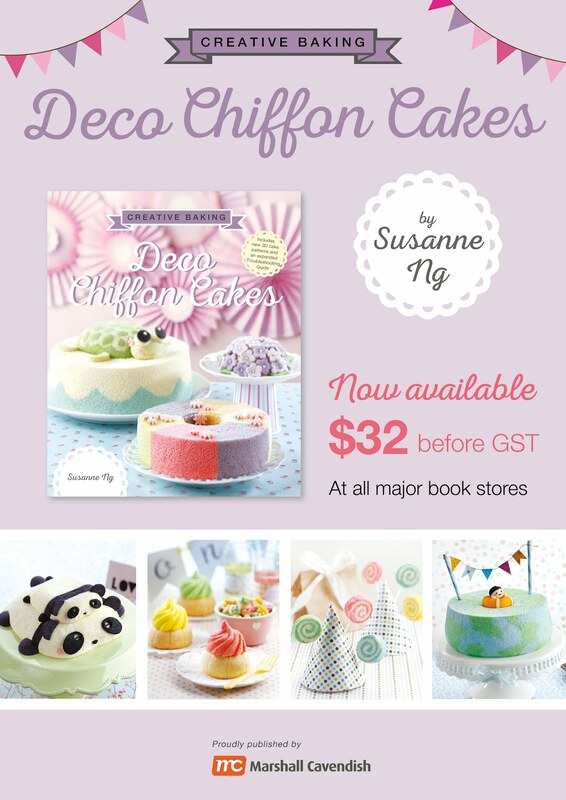 The middle is the polka-dot-themed tier and made of strawberry chiffon. The bottom tier is hearts-themed and also cream vanilla chiffon. 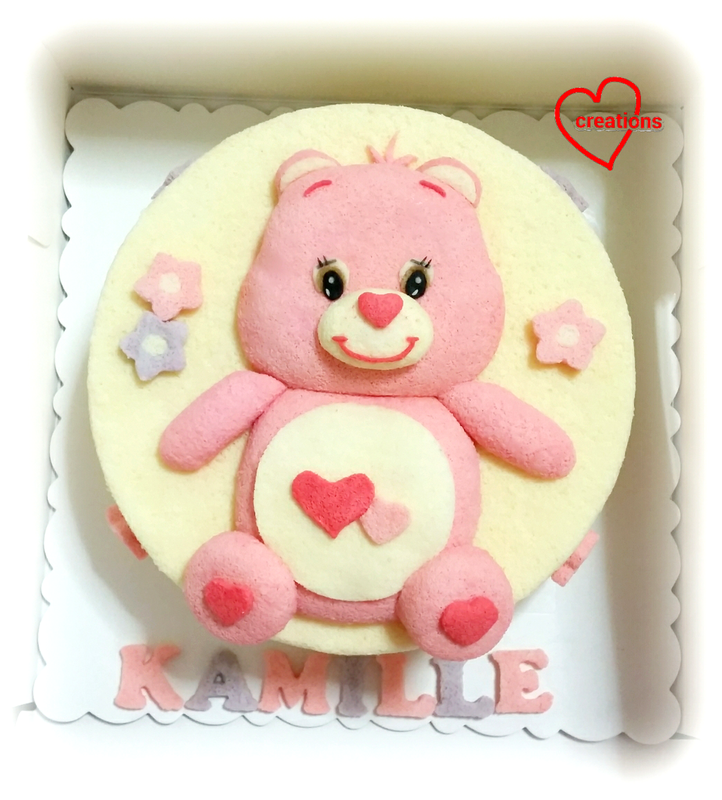 The cake was made with lots of love. Happy birthday to Calista. 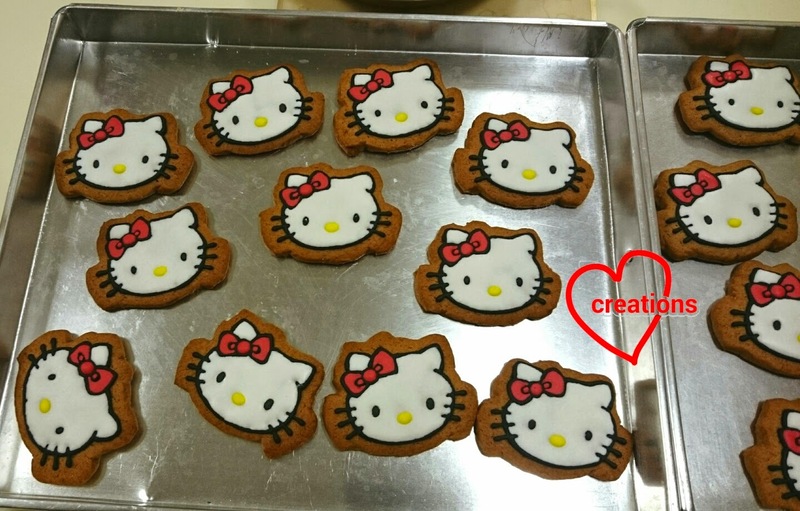 I made these for fun along with Hello Kitty macarons. 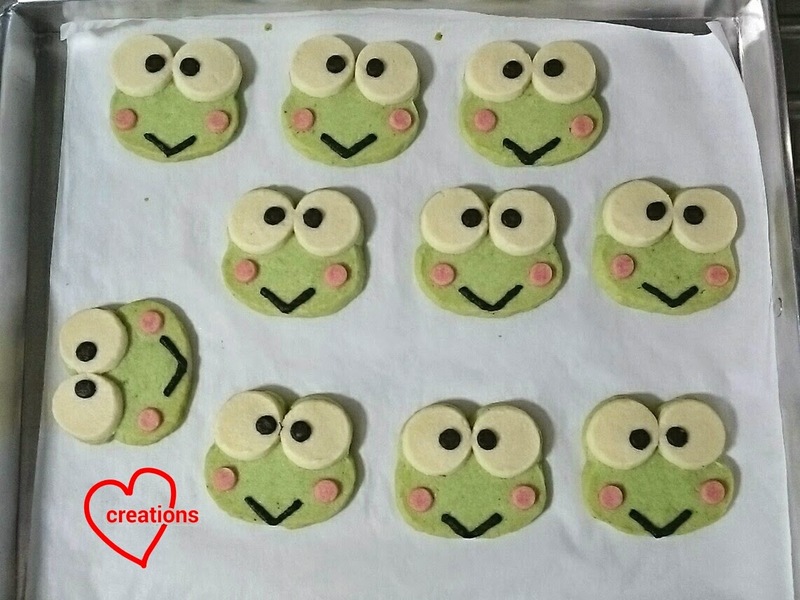 Originally intended to be given to my kids but they were all snapped up by the lady who requested for Keroppi cookies! Presenting my totally naturally coloured and flavoured Matcha Keroppi macarons with Azuki bean swiss meringue buttercream (smbc)! 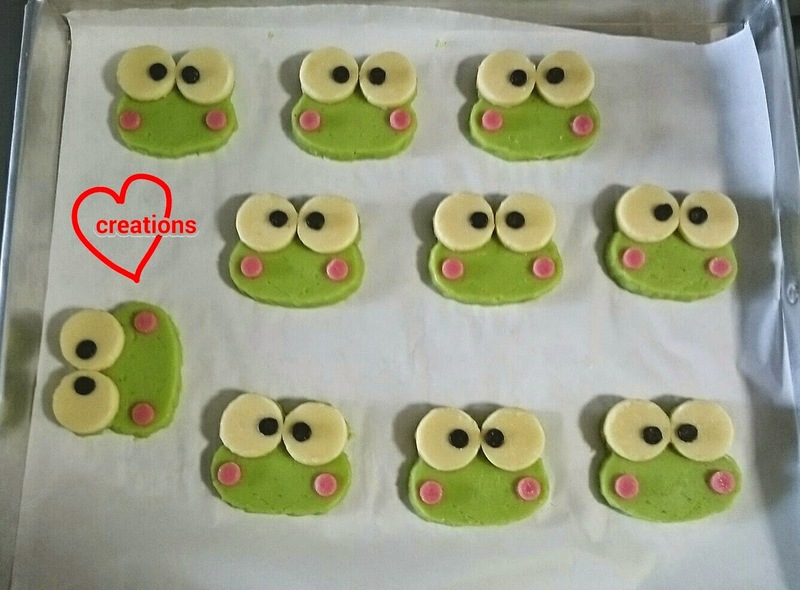 I was getting muddled after piping 90 Hello Kitty macaron shells and seeing stars by the end of drawing 45 Kitty faces so I didn't do a very good job for Keroppi. I piped the same pattern for both top and bottom shells so Keroppi ended up having exposed eyeballs at the back of the head :p. Should have piped plain green shells for bottom shells. 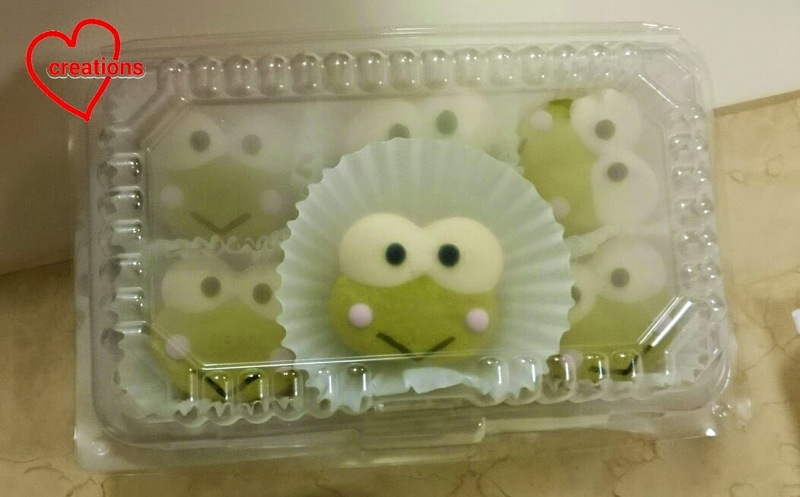 Keroppi's mouth wasn't drawn on too well even though it's just a "V". Anyway, glad that they are still recognizable! Here's the template I used. I only made 15 shells. 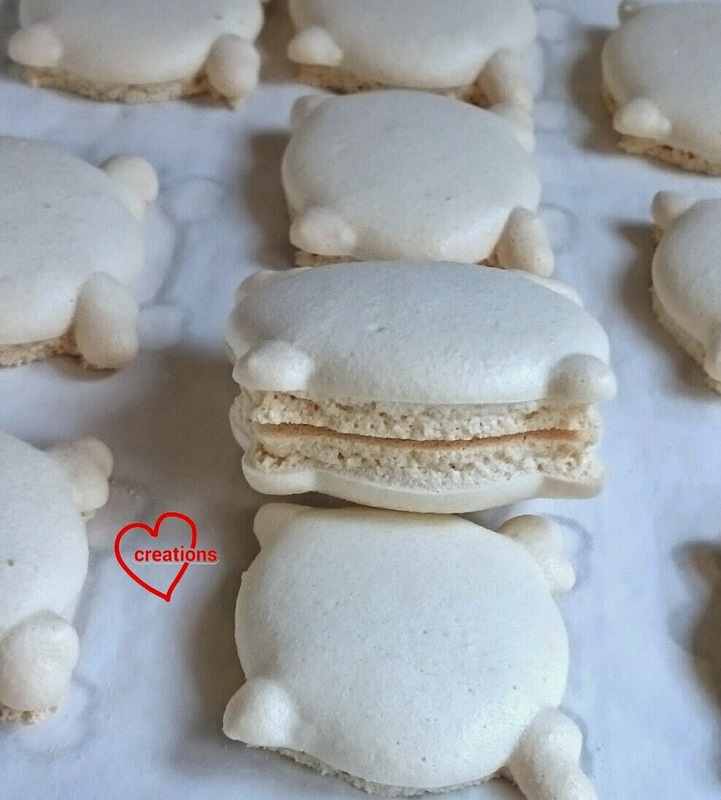 I will share the recipe for a larger batch of macarons for your convenience. 1. Sift almond meal with icing sugar. Add 80g of egg whites and mix well to form the mass. Portion out a quarter of the mass and leave it plain. Add sifted matcha powder to the remaining 3/4 of the mass. 2. Prepare the Italian meringue and fold in 1/4 and 3/4 of it in two batches to the respective masses. 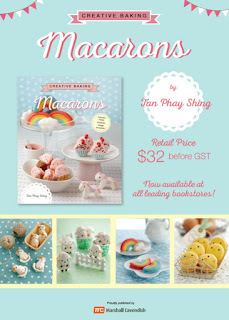 Please refer to this post for the details on how to prepare the Italian meringue and macaron batter. 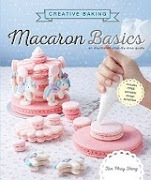 Refer to this post for video tutorials of the macaronage process. 3. Pipe the batter onto the trays with a 5-6 mm round tip. Remember to pipe plain green shells for the bottom shells. 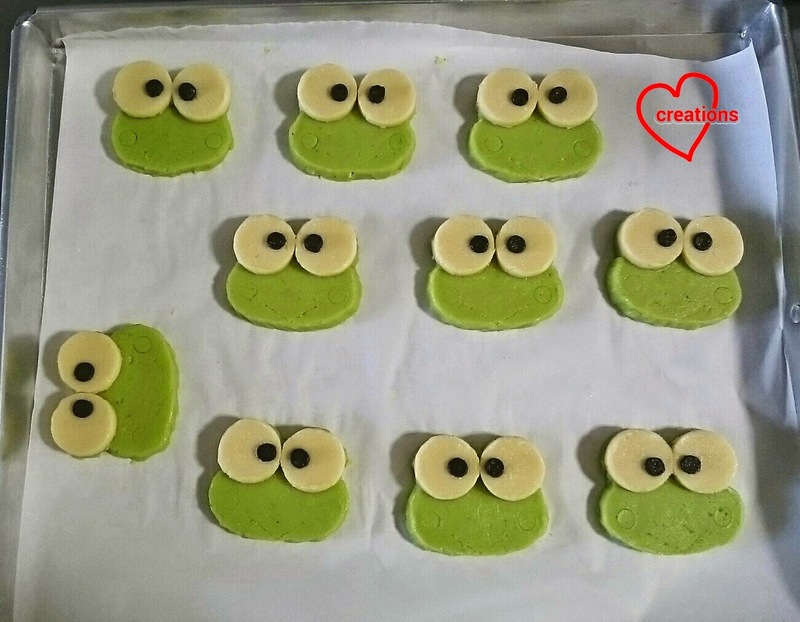 For Keroppi's face, pipe the eyes first, followed by a rounded green rectangle for the face. Tap the tray on the table a few times to release trapped air bubbles. 4. Bake at 130°C for 17-22 minutes at the lowest rack position, rotating the tray halfway through baking. Extend the baking time if the shells are still stuck to the baking sheet. Cool the shells for 5 minutes before removing from the tray. 5. Add on rosy cheeks and blacks of eyes. I drew on the mouth with edible marker. 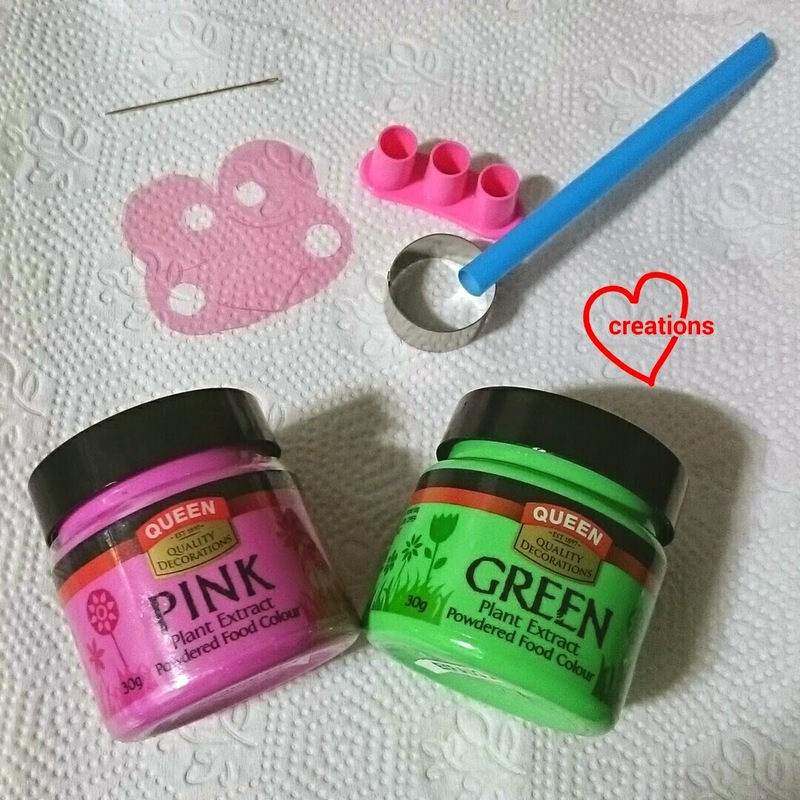 I used natural sourced pink food colouring (Queen's) to colour the rosy cheeks and charcoal to colour black. 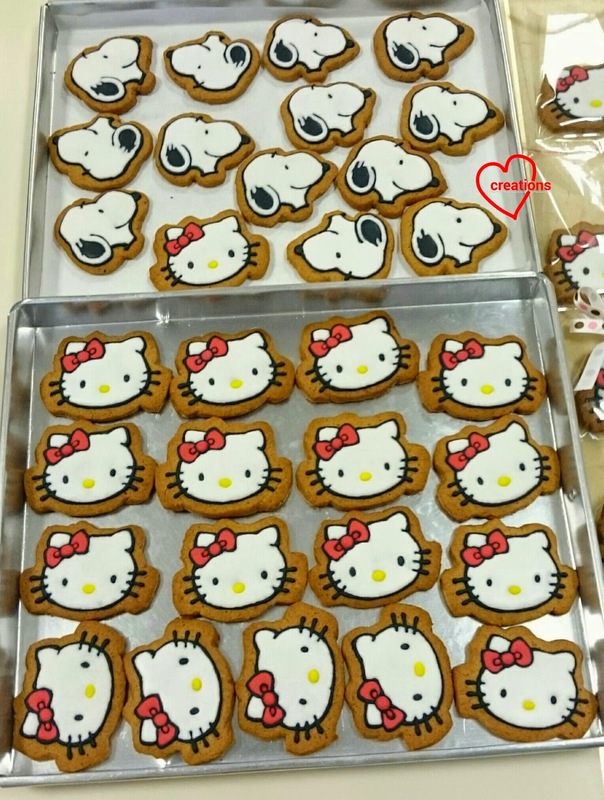 Make sure that the icing is completely dry before filling them. * Recipe for basic smbc can be found here. The addition of a bit of lemon juice helps to reduce the level of sweetness. Mix Azuki bean paste into smbc. Rewhip smbc first if you are using frozen-thawed smbc. Spoon the cream onto the bottom shells. My cream has whole beans in there so it can't be piped easily. Place the top shell on. Refrigerate the macarons in airtight container for at least 24h before serving. 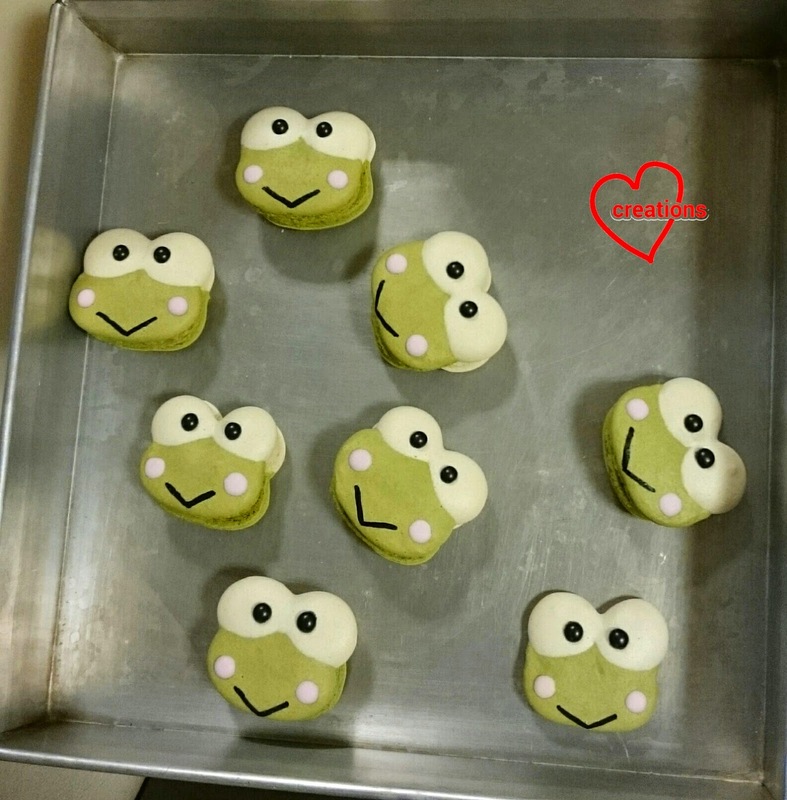 Let the macarons rest at room temperature for a few minutes before consuming. Princess Sofia is really small and cute! 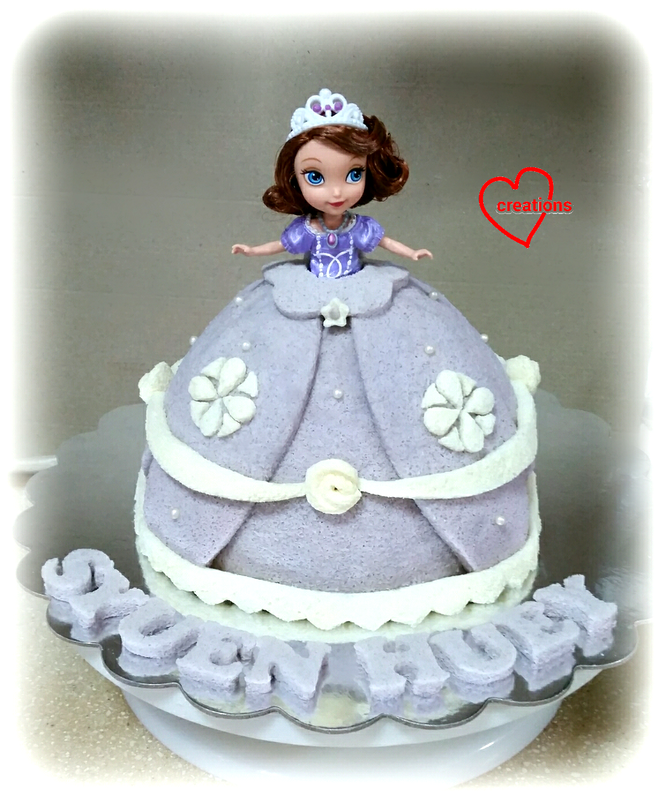 This is a Princess Sofia Doll version of my previous Elsa Doll Chiffon Cake. Here, I baked a blueberry chiffon cake (scale to 6 egg yolk recipe) in a doll cake tin to form the base of the gown. I have since found a way to prevent the blueberry from making the cake patchy. I made blueberry juice using the powder first and then used a coffee filter to remove the blueberry bits. Since Princess Sofia is petite, only the doll cake tin was required. I tried to create layers this time like real ball gowns by wrapping the base gown chiffon cake with layers of blueberry chiffon cake (2 egg yolk recipe, baked in layer tray) cut to elliptical shape. I baked an extra reduced egg white vanilla chiffon cake (scale down to 1 egg yolk recipe) in a 10-inch tray for cutting out the Princess Sofia motif and frills. I used chiffon cake rosette ruffles this time to tie the frills together for a softer gown look using melted marshmallows as glue. 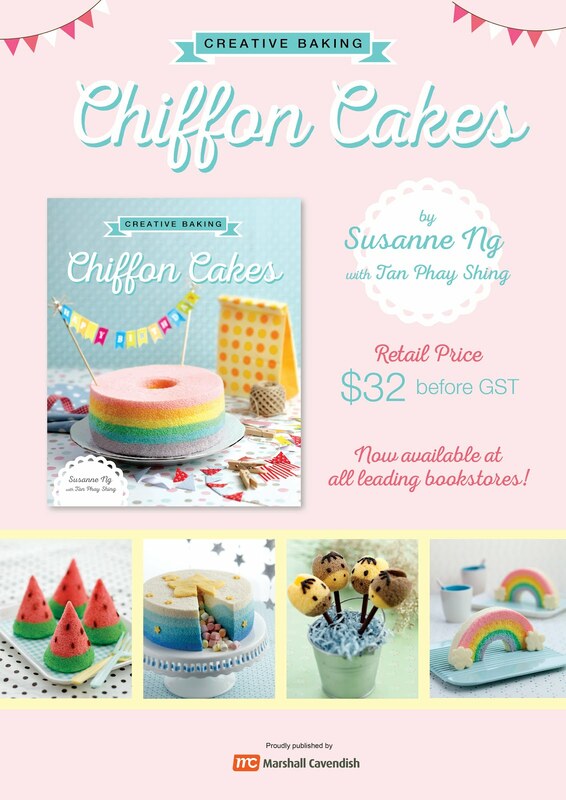 Thankful everything was well-received together with Phay Shing’s Rainbow SMBC chiffon cuppies! 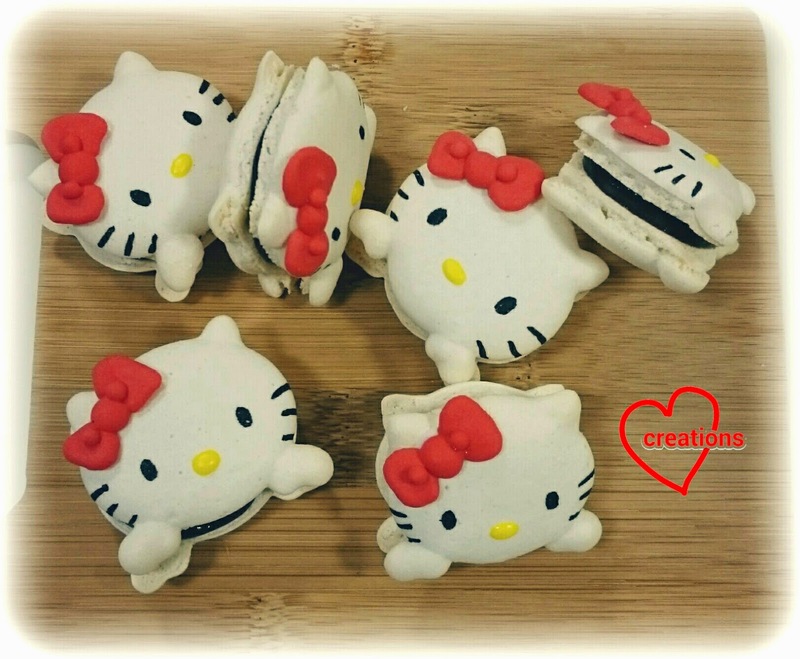 I have been making cute macarons for about half a year and this is the first time I have a request for Hello Kitty macarons. 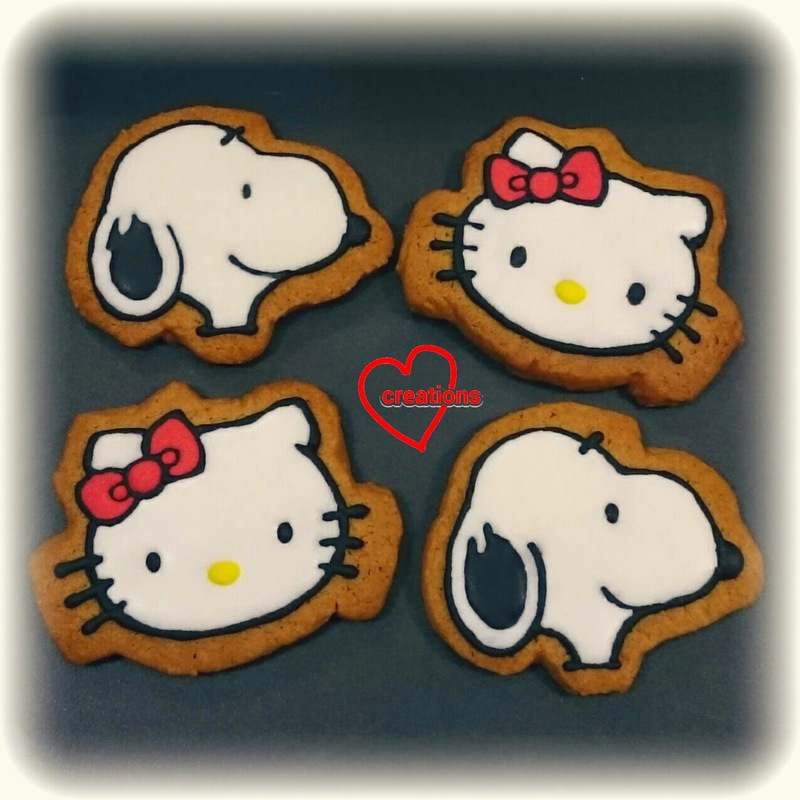 Hello Kitty with hands on face! Not just a Hello Kitty head. Here they are! 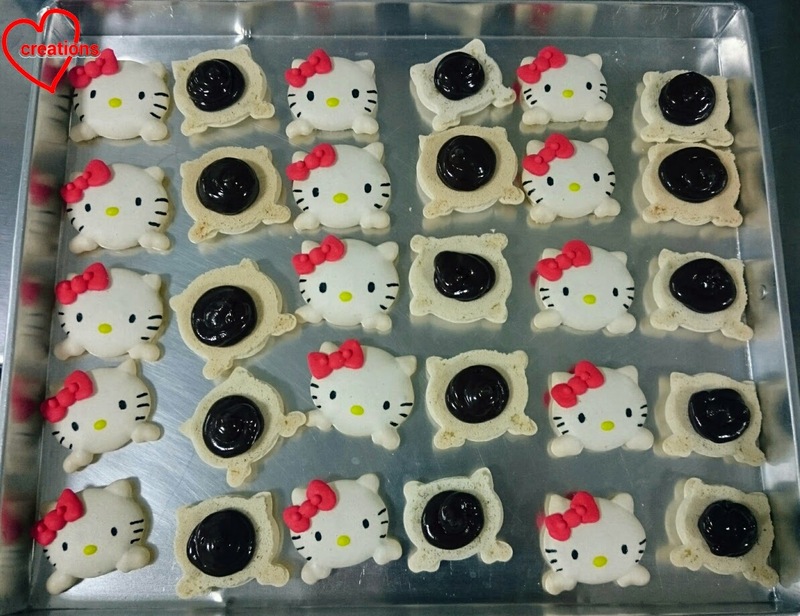 Other than pandas, Hello Kitty is probably one of the most popular fancy macarons around so what I made is not unique. I was wondering how to inject the wonderful aroma of rosebuds into the shells without adding moisture into the macaron batter. I did an experiment of storing icing sugar with some rosebuds for a week. Storing it longer would be better for a stronger aroma. 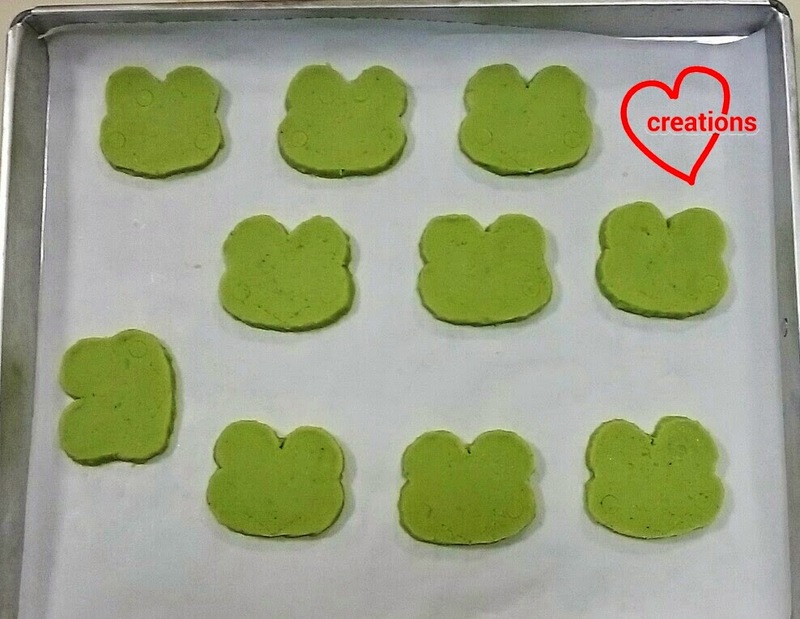 I am going to use it again for more macarons some time in May! As usual, I prepared templates. It is not necessary to make a mirror imaged template for the bottom shell. 2. Make the italian meringue. Place the caster sugar and water in a small saucepan and heat it over medium heat. Do not stir once all sugar has dissolved. At the same time, beat the rest of the egg whites in a clean metal bowl at medium low speed until foamy. Do not beat beyond the soft peak stage. Reduce beater speed if necessary. When temperature of syrup reaches 115°C, remove from heat. 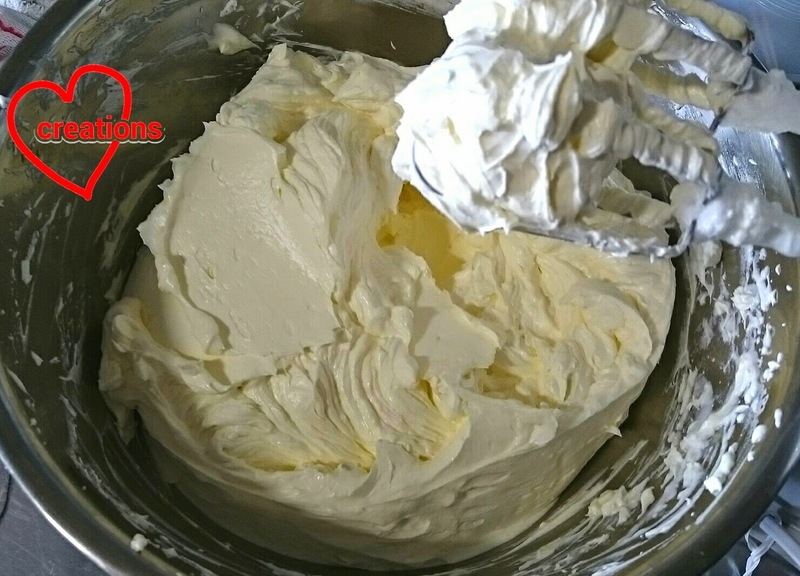 Increase mixer speed to high and carefully pour the syrup into the egg whites in a steady stream, avoiding the beaters. It is seriously more helpful to have a stand mixer to make Italian meringues. I felt like I had to grow an extra arm whenever I made this using a handheld mixer. But it is not absolutely necessary. Many bakers have successfully made beautiful macs without a stand mixer. The video I watch for macaronage is one such example. Continue beating at high speed until meringue cools. About 10-12 minutes. It should look glossy and stiff (second picture below). 3. Fold the meringue into the mass in 2 batches. The first batch is about one-third to lighten up the batter. Use a fold and press motion to fold in the meringue. 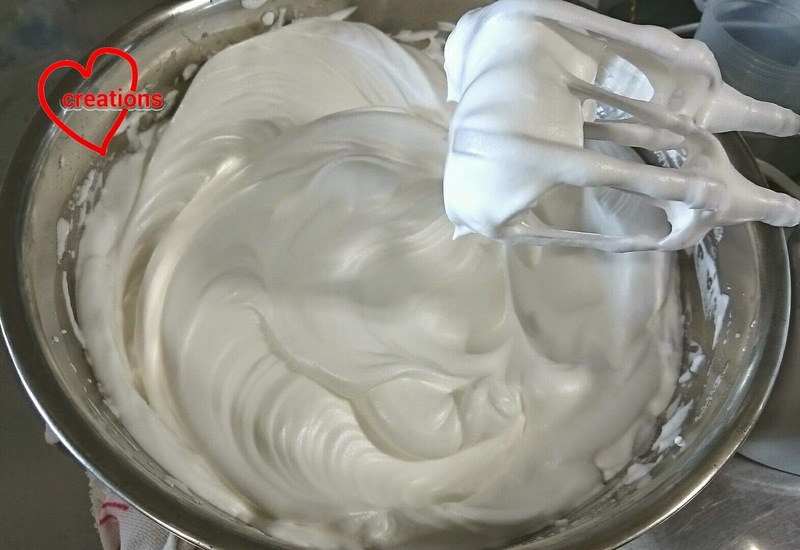 When the second batch of meringue is added in, fold until the batter is able to fall off the spatula in an almost continuous fashion. You have to underfold the batter a little for non-circular shaped macarons. Do watch a video of the macaronage process several times to get a feel of the correct consistency. I left about 1/4 cup of meringue unused. 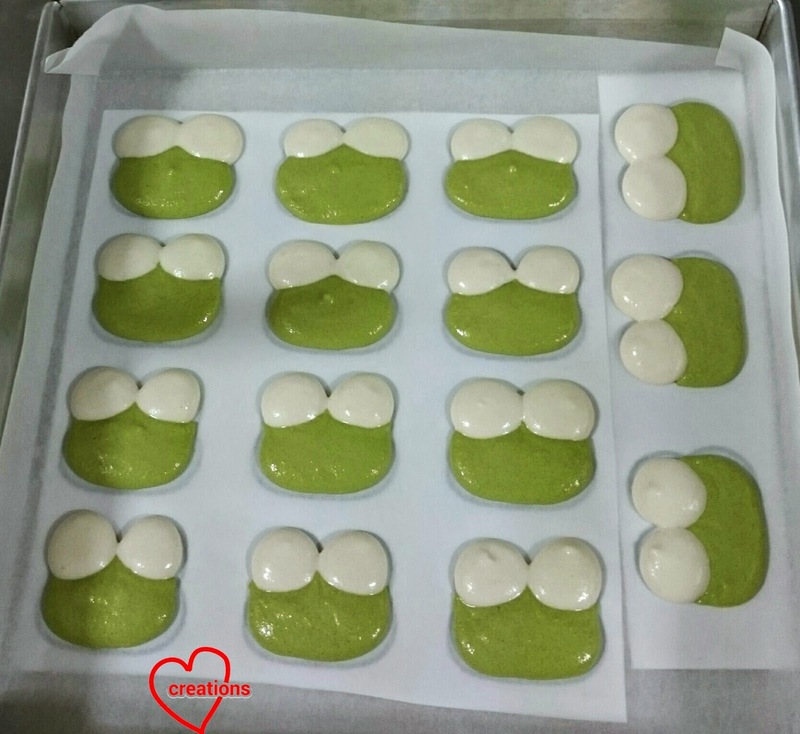 Third picture below shows the macaron batter. 4. Transfer about 2 heaped tbs of batter into a piping bag fitted with a round tip of about 3mm and the rest of the batter in a bag fitted with a round tip of about 5-6mm. 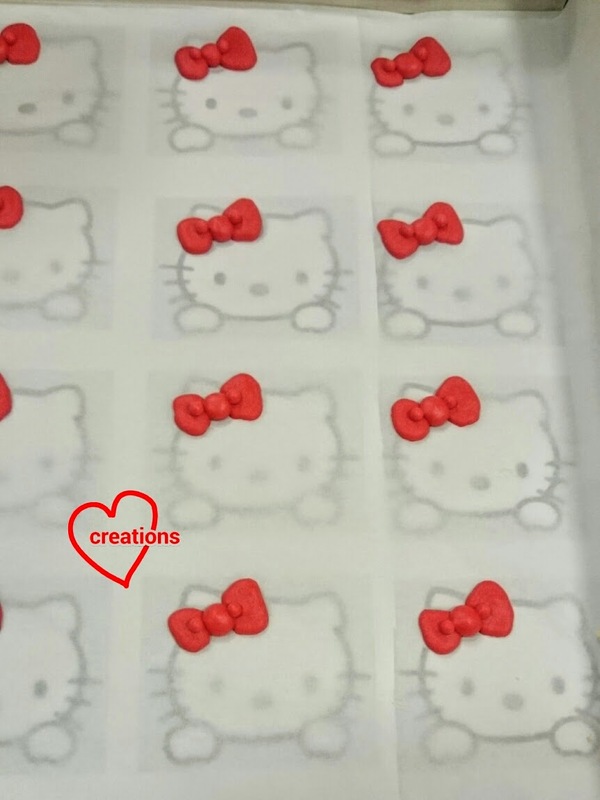 Pipe the oval head of Hello Kitty, followed by the ears (using the small tip). If you have a small leaf tip, that would be great for piping the ears but I didn't have one. I just piped a small dollop of batter and used toothpick to pull the batter to form the ears. Tap the tray on the table a few times to release trapped air bubbles. When the head has dried for about 15 minutes, you may add on the hands by piping using the small tip. 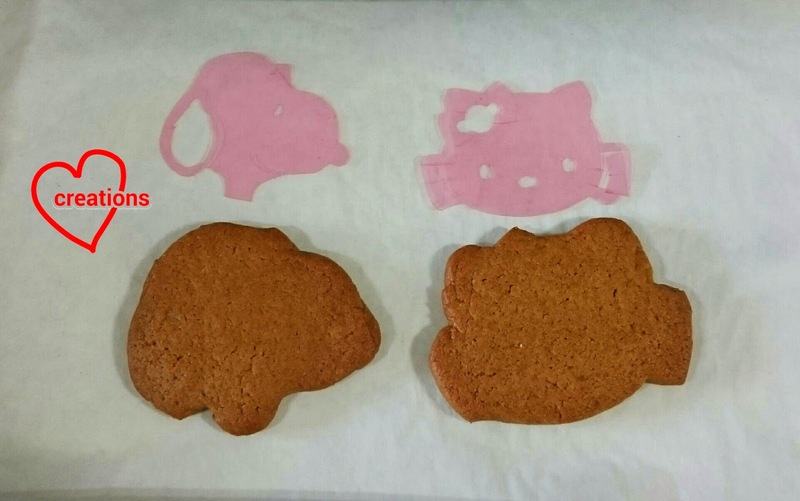 Remember not to fill the batter to the edge of the template as the batter will spread a little after piping. Almost ready to be baked! 5. Let the shells dry in air con room for 2 hours or use a combination of oven drying at 60°C for 8-10 minutes and then air dry or air con dry for the rest of the time. Make sure that the shells are not tacky to touch before sending them into the oven. Bake in preheated oven at 120-130°C for 20-22 minutes with the tray at bottom rack. Rotate the tray halfway through baking. You should be able to lift the shells off easily without it being stuck to the baking sheet. Bake a little while longer if necessary but watch out for browning. Let the shells cool for 5 minutes on the tray before removing them. 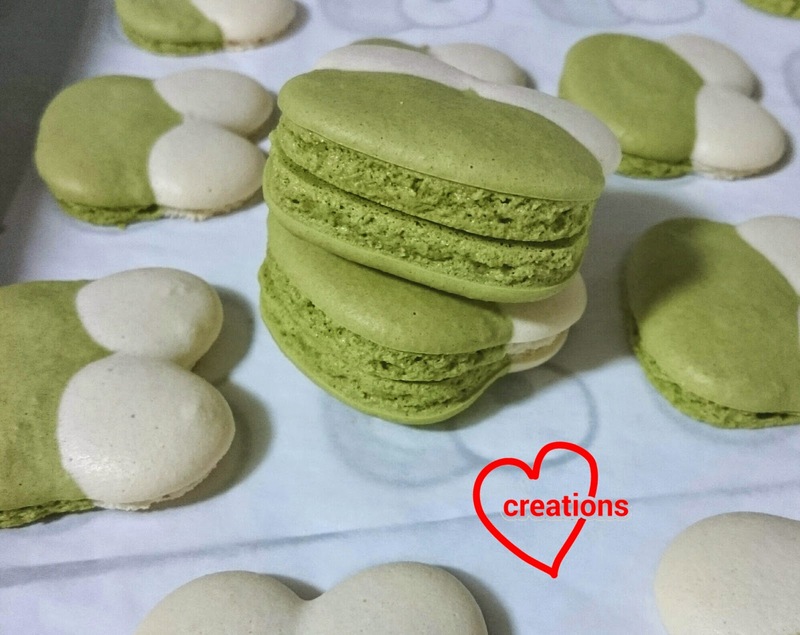 Pair similar sized macarons together. Store the shells in air tight container until ready to assemble. 6. 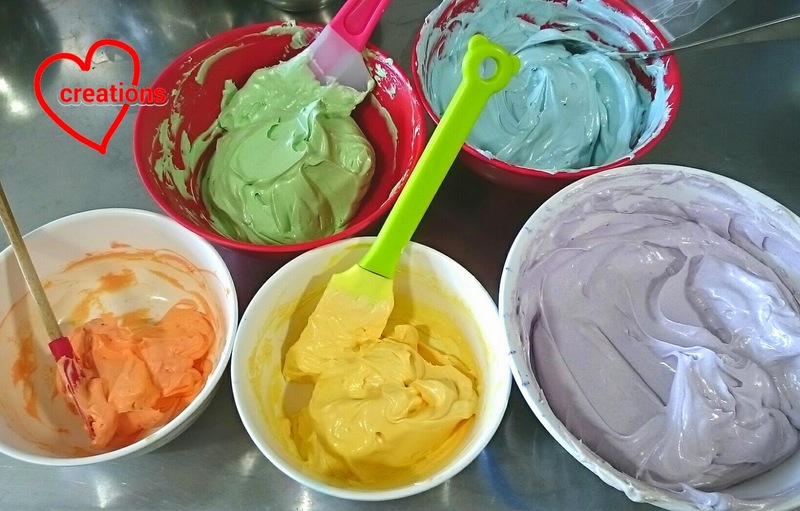 Prepare some red coloured royal icing and pipe the bow on baking sheet. 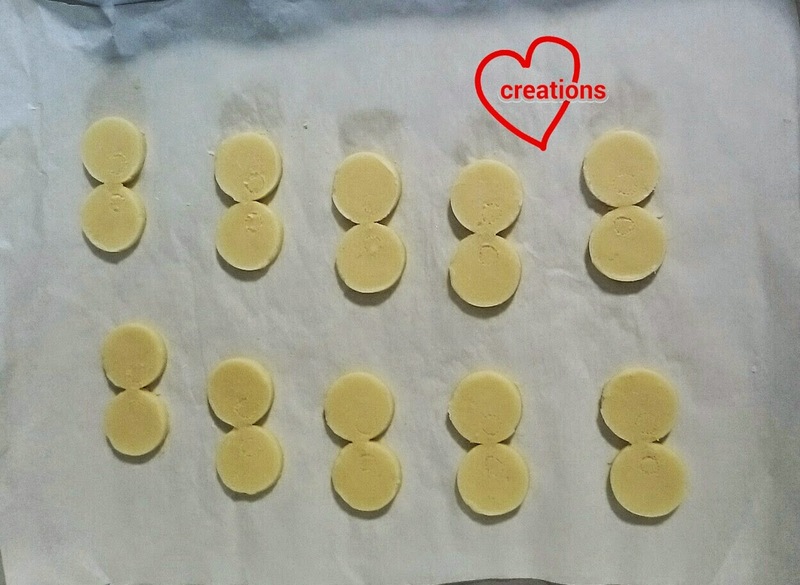 Simply use the same tray, baking sheet and template for making the macaron shells. Let the bows dry completely, preferably overnight, before attempting to remove them from the baking sheet. Wait for each segment to dry on the surface before icing another part in order to create 3D features in the bow. 7. 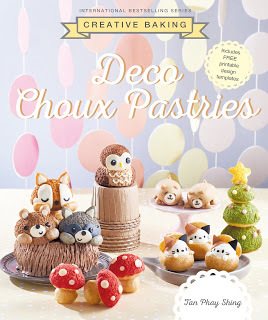 Use edible black marker to draw on the eyes and whiskers, and add on yellow nose using royal icing. You may use black coloured royal icing if you don't have a marker. It will be more tedious but it works too. Some people use templates to draw consistent features. 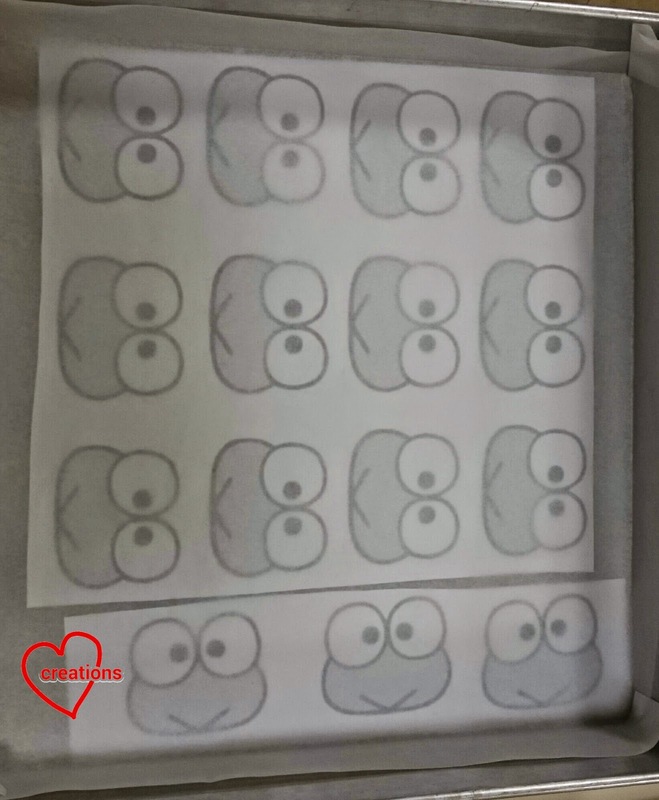 But since there is no way to pipe perfectly same sized macarons, it may not be helpful to use a template. I drew on the features by freehand. I was seeing stars by the end of drawing all 45 of them!! You may ask how did I do that? I used estimated distances for x- and y-coordinates of each feature, starting with the nose, then the eyes and finally the whiskers. 8. Stick the bow on using a bit of royal icing. Wait for icing to dry before filling the shells. 9. Pipe some chocolate ganache onto the bottom shell and place the top shell on. Refrigerate in airtight container for at least 24 hours before serving. 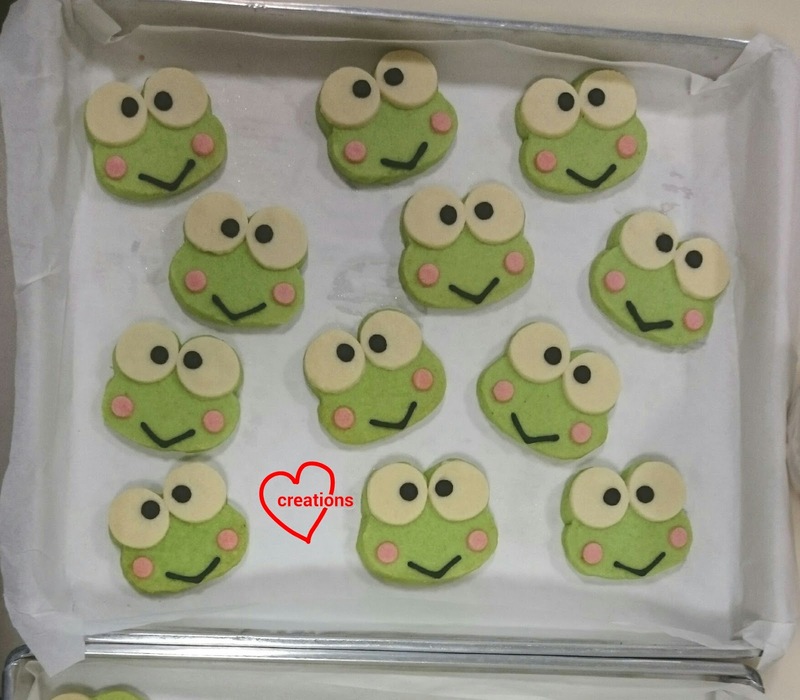 Let the macarons rest at room temperature for 5 minutes before consuming. Being packed for party! 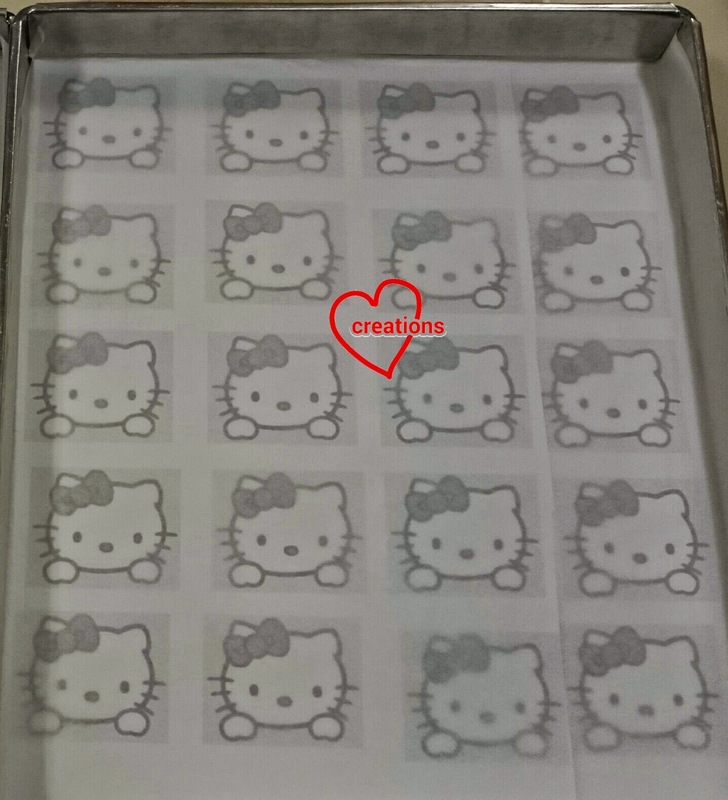 I love the Hello Kitty packaging that the requester sent me! 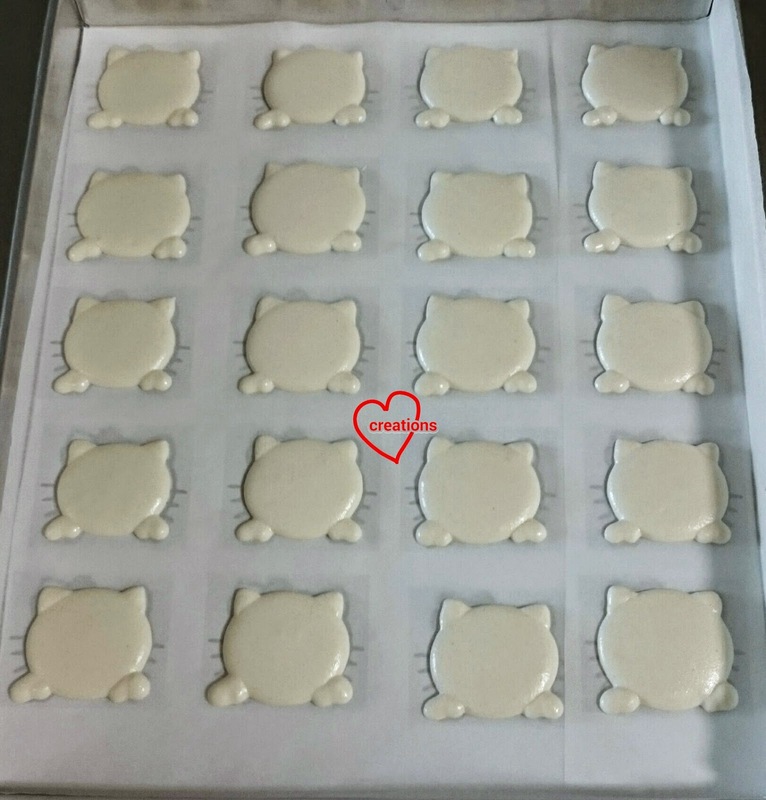 I inserted a ring of rigid but flexible transparent plastic sheet to prevent the macarons from being crushed when stacked in the box for transport. All packed and ready to party! 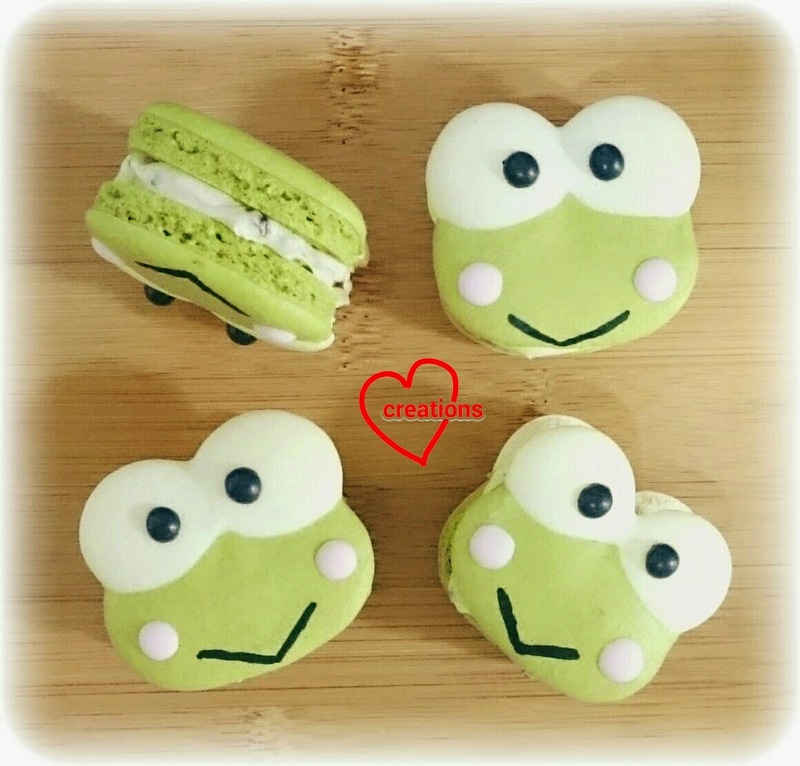 I made these along with a small batch of Keroppi macarons which were promptly snapped up by someone else! 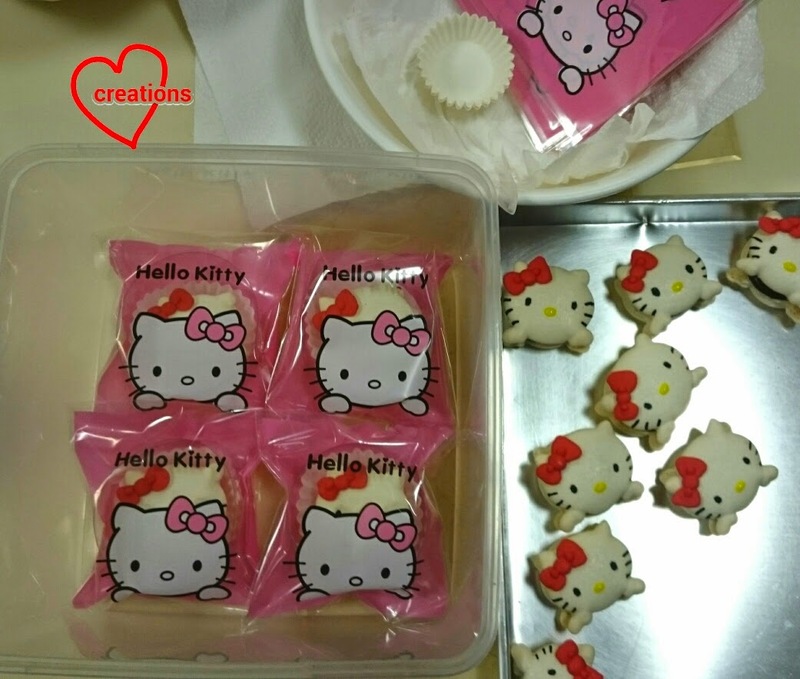 Checkout my full-body version of Hello Kitty macarons here! 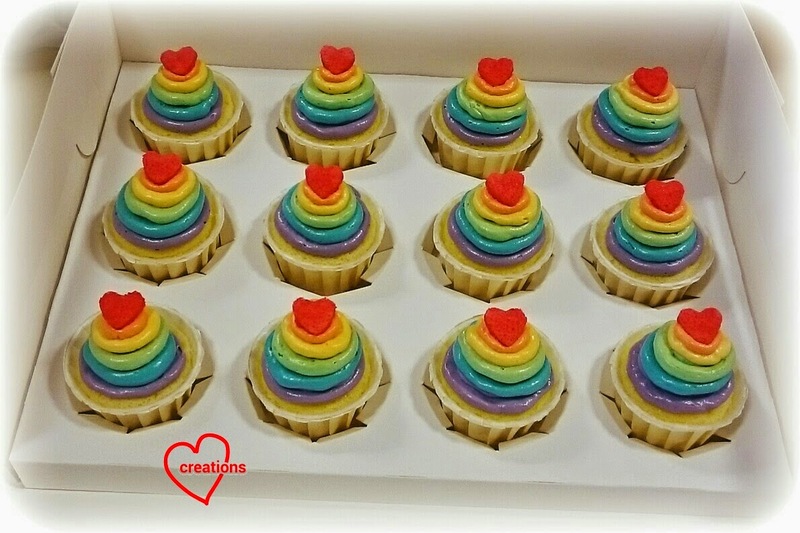 I have a request for quite a big batch of cupcakes with rainbow cream. This is my first attempt at cupcakes with cream so pardon my amateurish piping. I still have lots to learn and practice. Presenting my humble attempt, topped with red chiffon hearts! Here's 2 of them but I actually made more than 50. 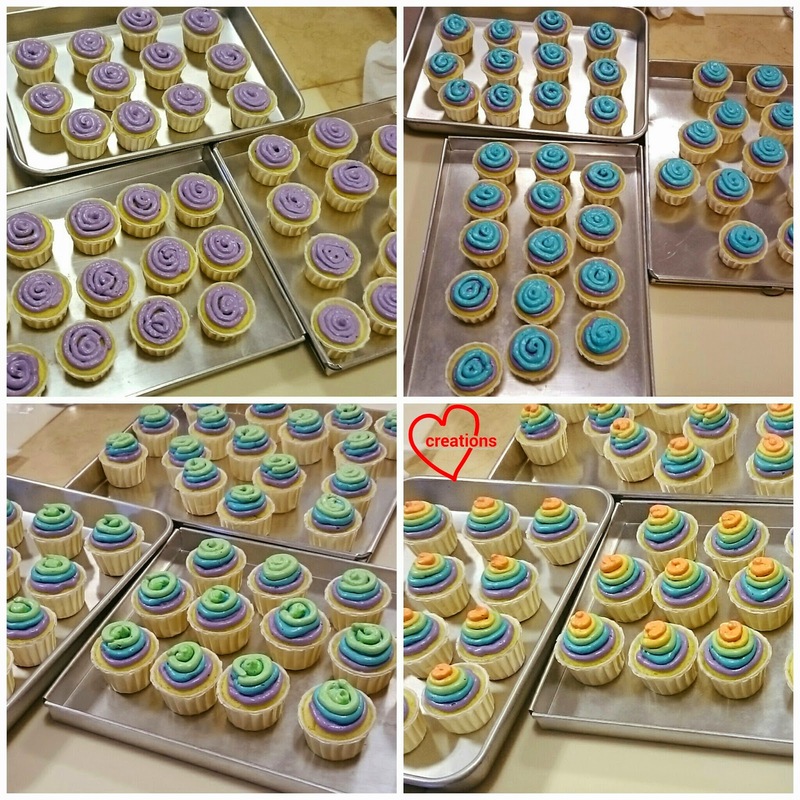 The request was for 42 cupcakes but I had more than enough batter so I made extra. My neighbors and kids had the extras and said the cakes were yummy! 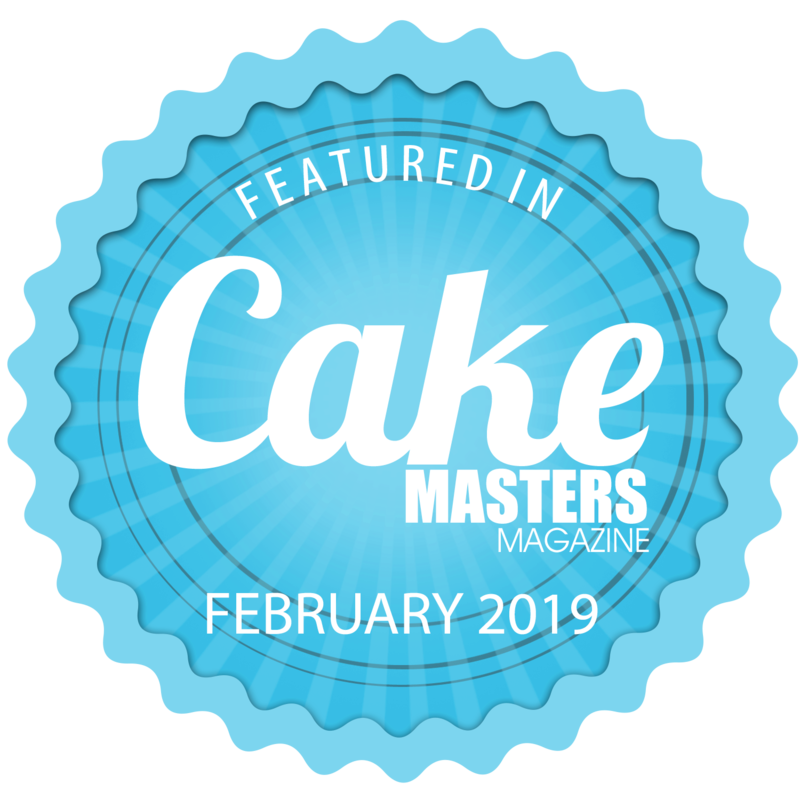 I used milk and honey chiffon cake as the cake base because kids who don't take to chocolate or fruity flavours love this flavour. 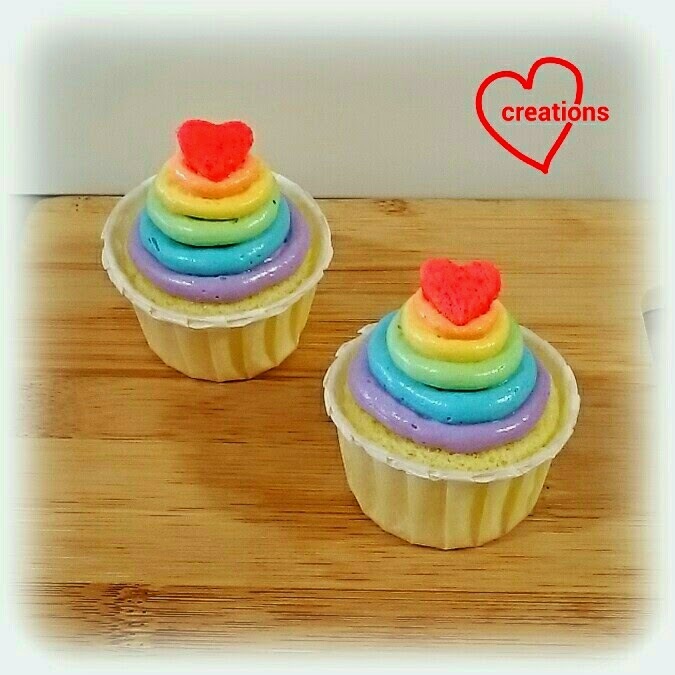 *You may wish to split the ingredients for the meringue into two equal portions if you wish to bake the cupcakes in two batches. 1. Place a tray of water at the base of the oven (optional) and preheat to 160°C. Do use an oven thermometer. I use it all the time when I bake to ensure consistent bakes. Set the oven rack to second lowest position. Line 6" tray with baking sheet. Dissolve honey in hot milk, set aside to cool. 2. Make egg yolk batter. Beat egg yolks and sugar until pale and thick. Gradually add oil and whisk until well combined. 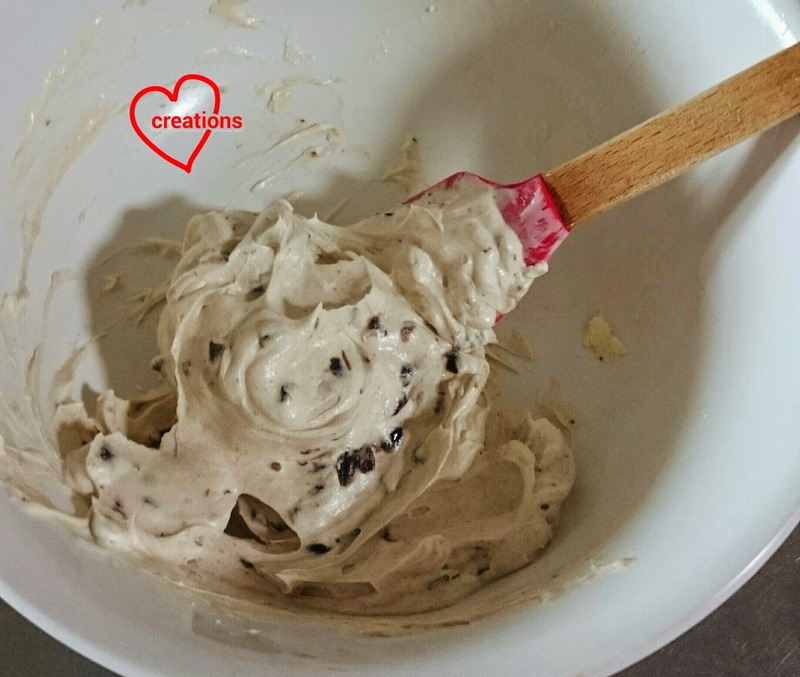 Gradually add milk with honey and vanilla extract and whisk well. Gradually add in sifted flour, salt and baking powder and whisk until no trace of flour is seen. Portion out 3 tsp of egg yolk batter and colour it red. 3. Make the meringue. In a clean metal bowl, beat egg whites with cream of tartar until soft peaks form. Gradually add sugar and beat until stiff peaks form and the bowl can just be overturned without the meringue sliding out. 4. Quickly but gently fold the meringue into the egg yolk batter in three additions. Portion out 8 heaping tbs of meringue for the red batter. 5. Fill the tray/ cupcake liners (almost full). 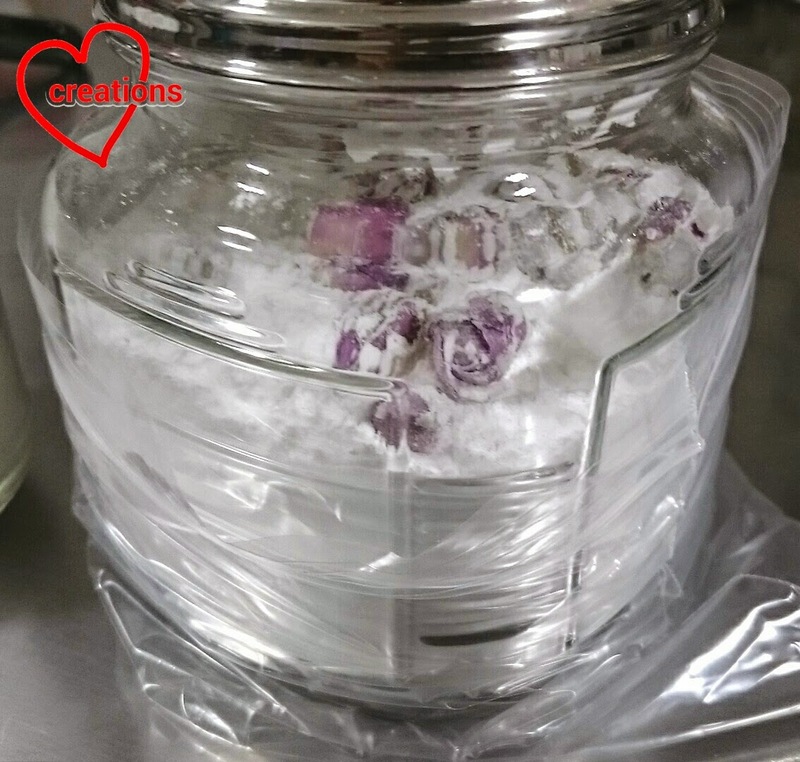 Immediately reduce temperature to 150°C. Bake the layer cake for 10 minutes and remove from tray immediately. Bake the cupcakes for 10 minutes at 150°C and reduce temperature to 140°C and bake for another 5 minutes or until skewer comes out clean. 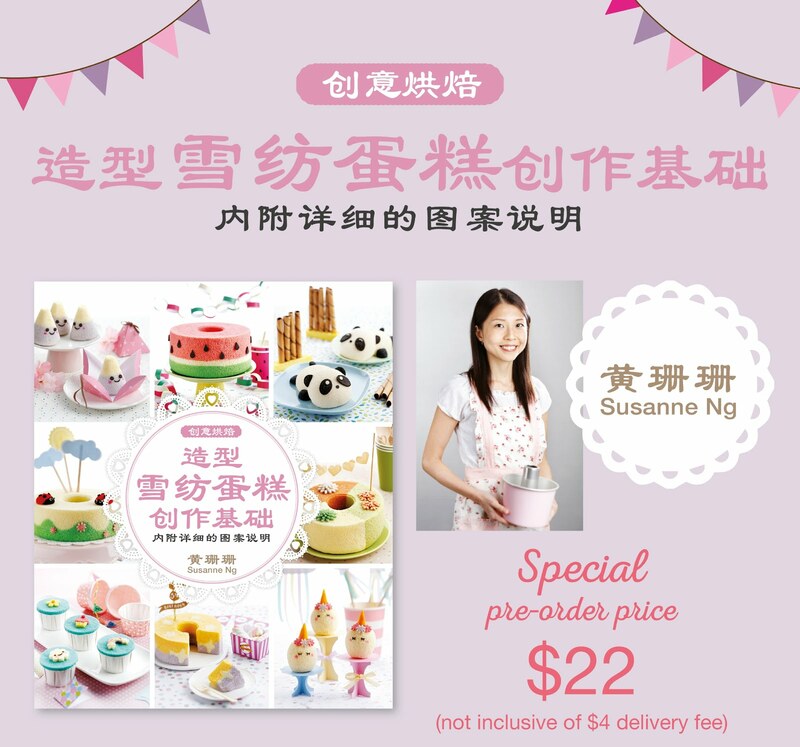 I have chosen to use steam baking at lower temperature to make the cake more moist and soft. Increase baking time if your cupcakes are bigger. 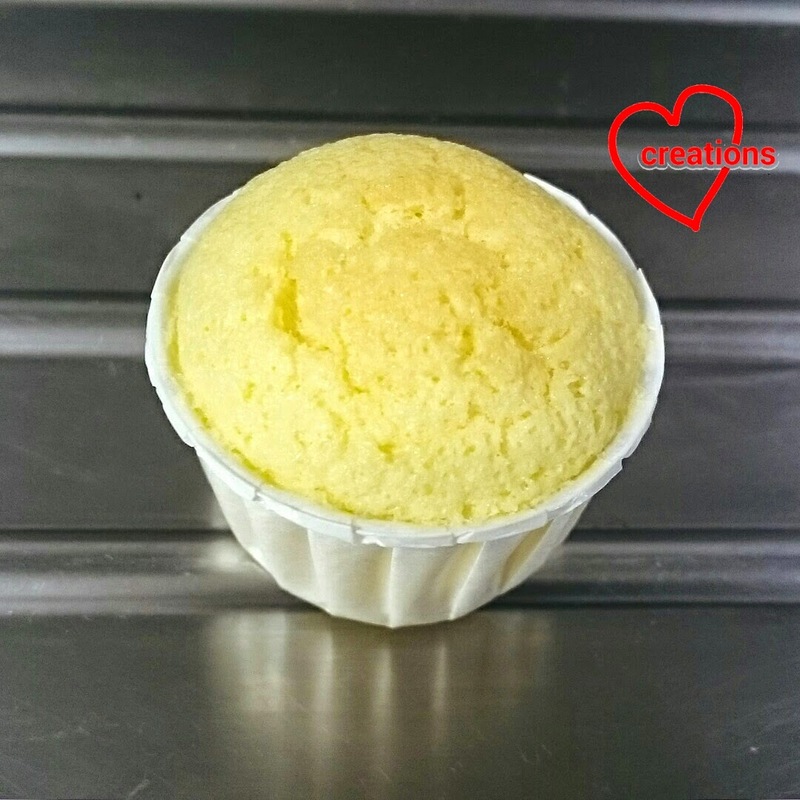 My flour:liquid ingredient ratio is also pretty low (about 60%) to keep the cupcakes moist and soft as there is no real need for structural stability like large chiffon cakes. The cupcakes will shrink a little after cooling. 4. Add in lemon juice and vanilla extract in a couple of additions, beating well after each addition until well incorporated. 5. Portion the smbc and colour each portion accordingly. Here's a rough estimate of how much to portion for each colour. I reserved about 75-100g of plain smbc for future use. You may prepare the smbc ahead of time and freeze it up to a month. 1. Rewhip the smbc if you use frozen-thawed ones like I did. Transfer into piping bag fitted with a round tip. 2. Pipe each layer, beginning with the largest circle (purple) at the bottom. 3. Top the cupcakes with red hearts cut out from the layer cake with a small heart shaped cutter. You may wish to brush on a bit of simple syrup (1:1 ratio water:sugar) onto the hearts to keep them moist. Keep refrigerated in airtight container until it is time to serve. 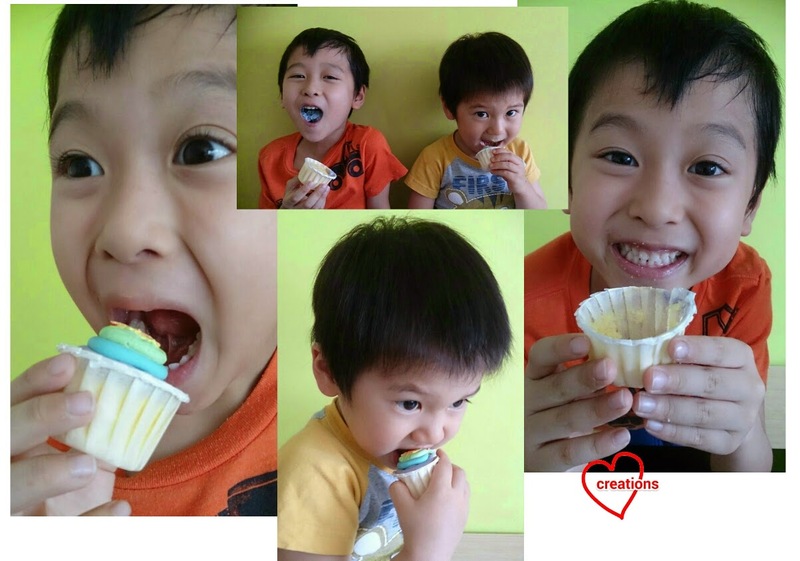 It brings a smile to my face when my neighbour sent me photos of her kids enjoying the extra cupcakes that I baked, thanking me and saying that they were yummy :). My neighbor's kids enjoying the cuppies! According to another neighbour, the cake with cream was really soft and light and not too sweet. Just nice!